In Western, developing, and totalitarian countries alike, the armed forces are powerful political organizations that play key roles in domestic politics. Yet, the literature on civilian-military relations provides few comparative examinations of the military's political role. In 27 chapters devoted to representative countries, this handbook looks at the varying roles the military plays around the world. Political role is defined as substantial and purposeful involvement in the making and allocating of wealth and social and political values. 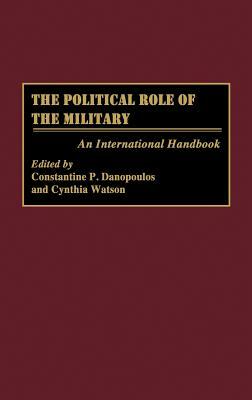 Using this definition, each chapter traces the historical background of civil-military relations in the country, identifies and analyzes the processes the military uses to exert political influence, evaluates the success and results of the military's political role, and projects future developments. As with any dynamic, organic body, the armed services in various countries change quickly and sometimes upredictably. The purpose of this book is beyond merely reporting whether a particular military is in the barracks as the 20th century draws to a close. Rather, the book offers analyses on the role that militaries have played in their societies, the historical forces that have shaped those roles, the socioeconomic constraints on them in the past, present, and anticipated in the future, and the current positions that armed forces have occupied in the last decade of the century. CONSTANTINE P. DANOPOULOS is in the Department of Political Science at San Jose State University. His most recent books include From Military to Civilian Rule (1991) and Civilian Rule in the Developing World (1992).CYNTHIA WATSON is a Professor at the National War College./e She writes on militaries in South America and the United States.